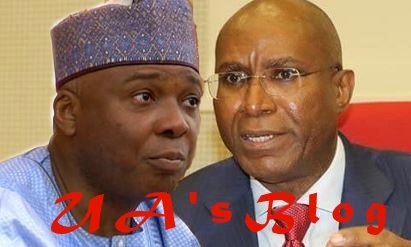 Nigerian senator, Ovie Omo-Agege has made a startling allegation, claiming that Bukola Saraki tried to impeach Buhari. Ovie Omo-Agege, the senator representing Delta Central senatorial district, has vowed that himself and other progressive senators on the platform of the All Progressives Congress, APC, would ensure that Senate President and senator representing Kwara central, Dr. Bukola Saraki is sacked from office and “chased away” from the senate. He made made the disclosure at Sapele, Delta State during the climax of his consultative visit to leaders, elders, ward and local council executives of the APC in Delta central on his reelection bid ahead of the 2019 general elections. The lawmaker who also used the opportunity to present his scorecard to members of his constituents, said: “As we speak, we have driven him out of the APC and we would also sack him as Senate President and chase him away from the senate. At the end of everything, he would know that it is me that is behind it. In his remark, Delta state APC chairman, Jones Erue who was a guest at the event assured aspirants of the party of a level playing field and expressed confidence that the APC would produce the next governor of the state come 2019.